According to projections from 2017 Assembly results, the SP, BSP and RLD alliance will turn the tables on BJP in eight seats going to polls on April 18. 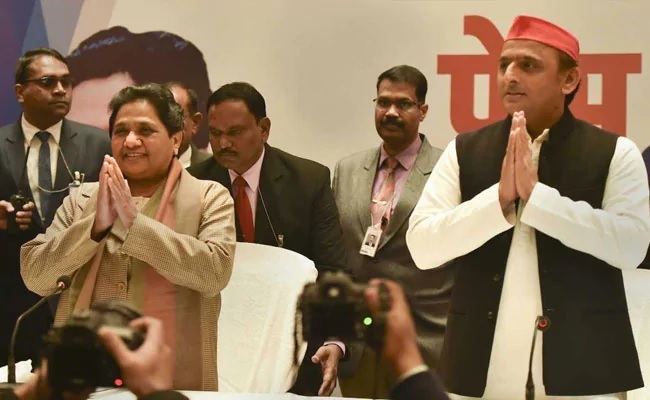 The Samajwadi Party (SP), Bahujan Samaj Party (BSP) and Rashtriya Lok Dal (RLD) alliance in Uttar Pradesh appears to be extending its lead over rival Bharatiya Janata Party (BJP) in the eight seats going to polls on April 18, in the second phase of polling. The ruling BJP, led by Narendra Modi, had won all the eight seats in this belt in 2014 by handsome margins. In the 2017 Assembly elections, too, BJP had soundly beaten the other parties. The eight seats going to polls in the second phase are: Nagina, Amroha, Bulandshahr, Aligarh, Hathras, Mathura, Agra and Fatehpur Sikri. This is a belt stretching from the north to south overlapping – a transition area from the rich, high-intensive agriculture to the west to the non-Green Revolution type customary agrarian systems eastwards. Due to the large Muslim population, there are many well-known traditional industries – brass in Moradabad to essential oils in Hathras – in this belt. But the feudal social order too becomes more and more evident here. An analysis of votes polled in the Assembly elections using data tools developed by Newsclick shows that if votes received by the Opposition parties are pooled, the results are dramatically different. 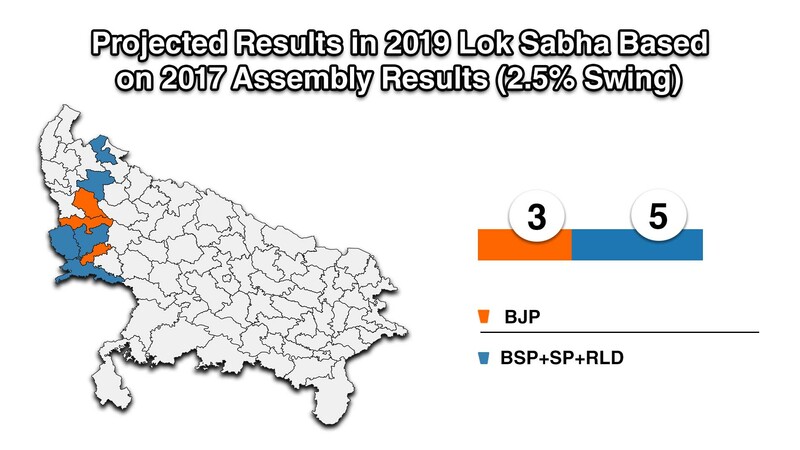 Adding up the votes of SP, BSP and RLD in the Assembly elections and mapping them to the respective parliamentary constituencies shows that the alliance – popularly known as the Gathbandhan – will wrest three seats while BJP will manage to retain five of its seats. This is simple arithmetic. The BJP got 45.2% of the polled votes in these seats while the Gathbandhan got 46.8%. The question may strike you that with more votes, how come the Gathbandhan is not winning all the seats? The answer lies in the uneven spread of votes, especially for RLD, which got as many as 2.2 lakh votes in Mathura but only about 6,000 in neighbouring Agra. If you factor in the evident anger with the Modi regime at the Centre, and the Yogi Adityanath-led BJP regime in UP, the balance tilts decisively away from the BJP in this belt. 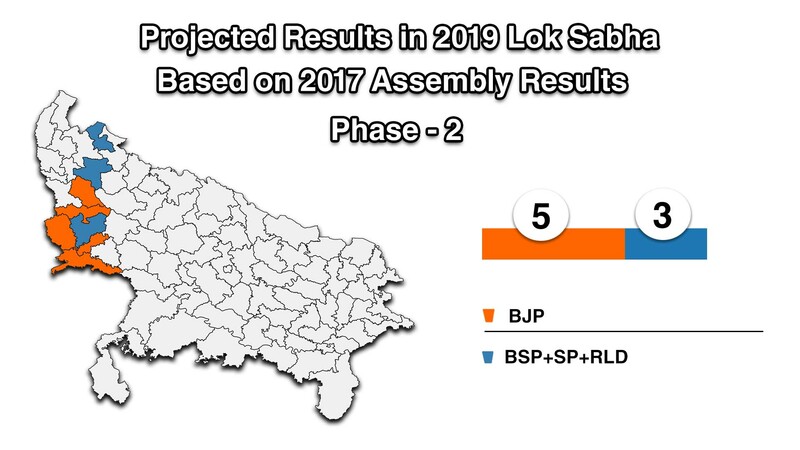 Taking a reasonable (and conservative) swing of 2.5% votes away from BJP, which benefits the Gathbandhan, Newsclick projections show that BJP wins only three seats, Bulandshahr, Aligarh and Agra, while the remaining five go to the Gathbandhan. Even among the three seats that BJP wins, the margin of victory is about 6,000 votes in two seats (Aligarh and Agra) by this projection. It could very easily slide further and these two also would go to the Gathbandhan, raising their tally to seven out of eight. In this belt, the social composition – with large shares of dalit and Muslim population – is stacked against BJP, especially after experiencing the hostile actions of the Modi-Yogi duo. The treatment meted out to Bhim Army chief Chandrashekhar Azad, the Modi government’s stand on the dilution of law against atrocities on dalits and adivasis, and the generally Manusmriti inspired ideological dominance of upper castes has unleashed a deep resentment among dalit communities in the area. Similarly, the open support to fanatic Hindutva forces, which include those who lynched Mohd. Akhlaq in Dadri (which falls in adjacent Gautam Budhh Nagar constituency) in 2016 and the mob violence over cow carcasses in Chingrawati (in Bulandshahr) have terrorised the large Muslim population in this region. Add to this the widespread anger at crashing farm produce prices, notably of potatoes (widely cropped in this region) and sugarcane payments issue, and the 2.5% swing away from BJP starts to seem like an underestimate. There is also the factor of larger discontent with Modi government. It’s disastrous economic policies, like demonetisation, imposition of goods and services tax, inability to provide jobs etc., have pushed large sections of people who earlier supported Modi, into the Opposition camp. So, the projections given above, are very reasonable. Add to this, the losses suffered in the first phase (BJP was projected to lose six of the eight seats it won there last time) and it becomes clear that BJP is set to suffer debilitating blows in UP, the largest state of the country with 80 seats.